Opportunity Knocks: Let the Games Begin! As I am sure most of the world did as well, I was overjoyed to watch the Opening Ceremonies of the Olympics yesterday! I love the Olympics just as much as the next person, but since we don't have a TV at home, had to look for someone to watch it with! 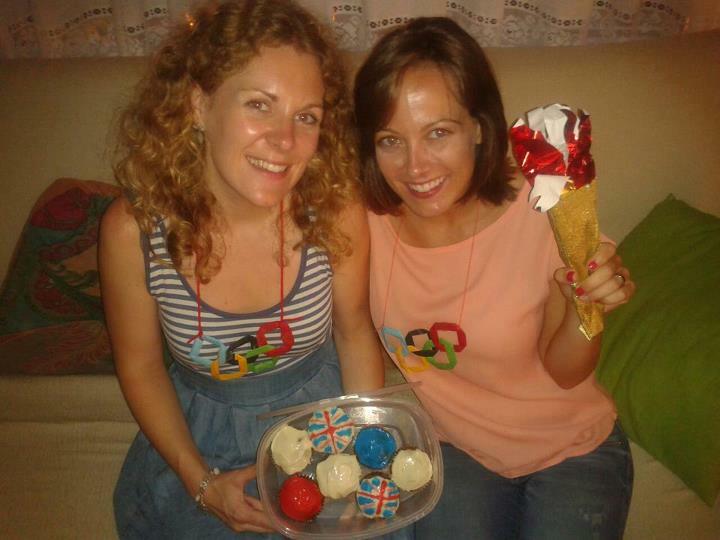 My English friend Holly was a perfect candidate because she was just as excited about the Games as me. Having done Olympics as my last unit in Summer Camp, I had a lot of fun little things to bring over when I headed over to her place for the start of the events. I appeared at her door with a torch and then proceeded to shower her with coloring pages and dot-to-dots in case she wanted to do them in between events. I placed an origami Olympic rings necklace over her head and then one over mine so we'd be twinners, or Olympic Groupies as her husband named us. We watched anxiously as the Ceremonies started and were highly impressed. Shame that Queenie didn't really jump out of the helicopter though haha! 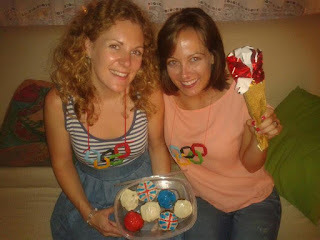 As the athlete parade begin, we started on our Team GB cupcakes that I'd made for the occasion (carrot cake cupcakes that mm mm good!). We commented like girls do on all of the outfits of the countries, some good some bad. For all the chatter about the US uniforms, I was quite disappointed. The boys looked ok in my opinion but the girls' below-the-knee-length skirt really threw me for a loop. Regardless, we just loved how happy and proud the athletes looked. We toasted to the Olympic torch lighting with some champagne and were happy to say, Let The Games Begin! I give summer camp a gold medal! The USA is more Basque than you know!